We are highlighting a handful of restorative practices research reports done over the last decade, some of which we have been involved with closely. 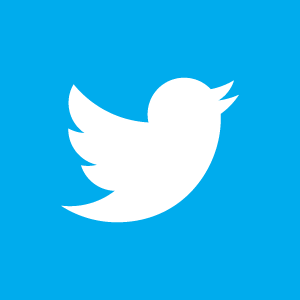 Please let us know if there are other reports you would like us to include so that others may be aware of them. We strongly support evidence based programs and believe restorative practices should have some kind of evaluation component as part of a healthy and sustainable implementation effort. Note: Click on links (in bold) to go to view/download PDF document. 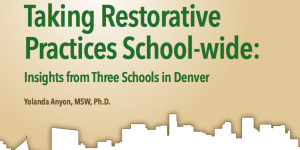 Through interviews and focus groups with staff members at three Denver schools that have successfully implemented restorative practices (RP), four essential strategies for taking this approach school-wide were identified: strong principal vision and commitment to RP; explicit efforts to generate staff buy-in to this conflict resolution approach; continuous and intensive professional development opportunities; and, the allocation of school funds for a full-time coordinator of RP at the site. Additional approaches that supported school-wide implementation of RP are described in the full report. 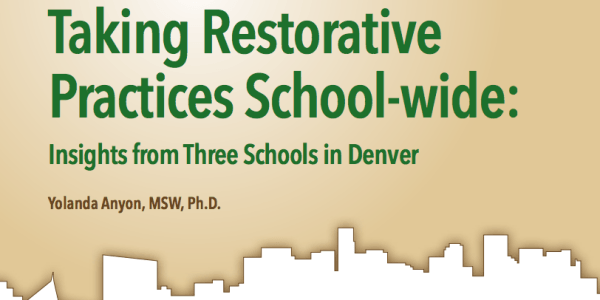 In May 2006, Denver Public Schools (DPS) proposed to implement a Restorative Justice (RJ) Program within three middle schools and one high school. The overall goal of the project and the district-wide reform is to reduce the number of suspensions, expulsions, and police intervention incidents in each school. Read the first year findings of this program coordinated by Restorative Solutions. Read the second year findings of this program coordinated by Restorative Solutions. Why Are We So Enamored with Imposing Consequences? Can Everything Be Done Restoratively?